Chick-fil-A is closed on Sundays. It's probably the first thing that comes to mind when you think the brand -- besides, ghee, its chicken is really good and, ghee, its record on LGBT issues really isn't good. But Chick-fil-A bucked tradition and opened on a Sunday this week. And it was for a great cause: The chicken chain broke the Sabbath to aid Hurricane Florence relief efforts. Apparently Local Chick-fil-A owners Donovan and Nikki Carless were watching coverage of the storm and asked themselves: "What can we do to help?" The answer, naturally, as restaurant owners, was to give food to those in need. Carless talked to his team, which was also eager to help out, and they worked with the Red Cross to hand out 500 sandwiches and 1,200 nuggets, spread across three different shelters. The Carlesses personally delivered the nuggets. This isn't the first time Chick-fil-A has done opened on a Sunday to help those in need. It's also given free food to stranded passengers during an airport blackout, among other instances of chicken-based altruism. "While Chick-fil-A restaurants are always closed for business on Sunday, some local restaurant teams volunteer to serve their communities in times of crisis," the chain explained to Business Insider. Maybe one day that kindness will extend to all Chick-fil-A locations every Sunday. 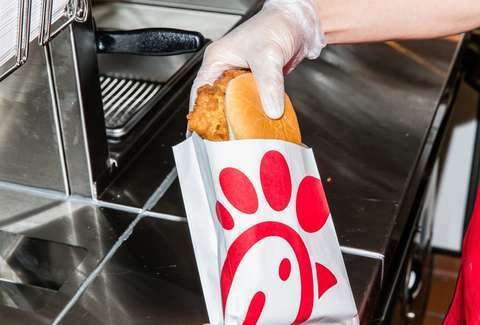 In the meantime, you can get your own free Chick-fil-A.